Did you know that 91% of people notice words and pictures when displayed on trucks? * Your marketing impact is even further magnified with the implementation of a fleet wrap, utilizing all the vehicles in your fleet. Did you know that metro trucks are seen by 14 million sets of eyes each year! * With a fleet wrap, car wrap, or truck wrap, you'll have more marketing exposure than with one costly billboard. 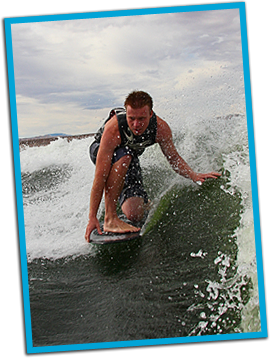 wakeboard, water ski, water sports boat charters and boat rental service located in Pleasant Grove Utah with service to Lakes in Utah, Nevada, Arizona, and Idaho and California. Wrapping a vehicle Multi colored, eye-catching, full color designs make vehicles quite a a lot more interesting and fun than a plain white boat. Traditional advertising methods would suggest the more money you spend, the more advertising you will receive; but with a moving vehicle wrap, you only have to pay a one-time fee to advertise and be seen by a whole city! Vehicle wraps allow you to control who and where your wrap will be seen. Wrap it up with a vehicle wraps, boat wrapy truck wrap, semit truck wrap, fleet wrap, auto wrap. You may not want to stop with your boat why not wrap you towing vehicle as well.